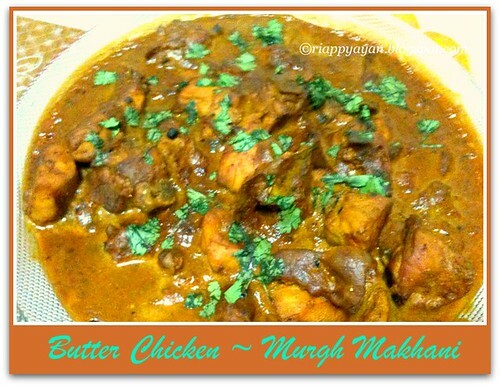 Butter chicken or murgh makhani is an Indian dish from the Punjab region. The origins of butter chicken can be traced back to Delhi, during the period of Mughal Empire. Butter Chicken is among the best known Indian foods all over the world. Its gravy can be made as hot or mild as you like so it suits your palates. Also commonly known as Murg Makhani, Butter Chicken tastes great with other Punjabi dishes like Kaali Daal (black lentils), Naans(Indian tandoor made flatbread) and a green salad. This delicious butter chicken was on my to-try list for a long time. I think this is one of the staples of Indian restaurants outside India. I have eaten in at least 5-6 different Indian restaurants in last few years and each and every one had this on their menu. There are many varieties of recipes for this dish. But I combined two of my favorite chef Sanjeev Kapoor and Chef Sanjay Thumma's Recipes and got an excellent result and today I am going to share my version of Butter Chicken here. This rich, creamy, buttery chicken is not for cooking every week, but an excellent celebration dish to indulge once in a while and can satisfy your craving of Restaurant style food at home. I made this dish for a potluck party and everyone complemented me. Take chicken pieces in a wide bowl. Apply a mixture of red chilli powder, lemon juice and salt to the chicken and set aside for half an hour. Add all the ingredients under marinade section in yogurt and apply this marinade to the chicken pieces and refrigerate for at least three to four hours, overnight works better. Heat 2 tblsp. oil in a pan, take few chicken pieces from the marinade at a time and fry until light brown from all sides. Set aside. [You can also grill or cook the chicken pieces in oven until done]. Keep rest of the marinade sauce aside, we'll use that sauce later in the gravy. Heat butter in a heavy bottomed pan, add cinnamon, cardamoms, cloves and peppercorns, sauté for two minutes or until they get a good aroma, then add ginger-garlic paste and slitted green chillies. Stir for two minutes in medium flame. Now add tomato puree, red chilli powder, garam masala powder, salt. Simmer and let it cook in low flame until oil/butter seperates from the spice paste. Add fried chicken pieces in the masala paste and nicely coat them in the masala paste. Add about 1.5 cup of hot water and simmer till you get your desired consistency of gravy. [If you have cooked the chicken in oven or grilled them, in that case add the chicken pieces now to the gravy]. Add cashewnut paste, sugar and kasuri methi. Mix well. Check the seasoning. Simmer your flame to low and add cream in the gravy. Cook for another 5 minutes. Remove from flame, garnish with fresh coriander leaves and 1/2 tsp. cream. Serve hot with Naan or Paratha. Goes also very well with Pulao or Simple Veg. Biriyani. Yum ....one of fav...I have to try making this . Murg makhani looks really tempting. Eta kheteo nichoi khub sundar hoyechhe. This is my favorite,creamy and delicious..thanks for the recipe dear..
kudos to ur patience Indrani!!! so many ingredients to churn out a royal classic!! good one! Wow. It looks very yummy and nice. Very nice recipe !!! my husband loves butter chicken......ill prepare this for him!! !